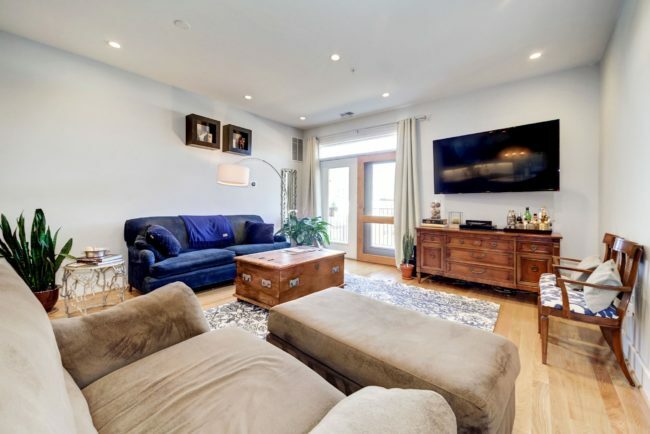 Welcome home to this stylish and cozy 2 bedroom, 2 bathroom condo, just 4 blocks from the Georgia Ave/Petworth Metro station, with a completely updated open kitchen, tons of storage spaces, and two HUGE outdoor areas! 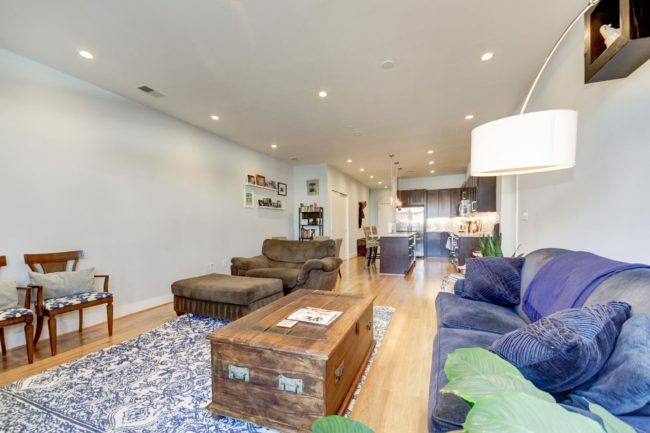 The bright, open floor plan in the living space invites you to spend time with friends and family, and makes entertaining a breeze! 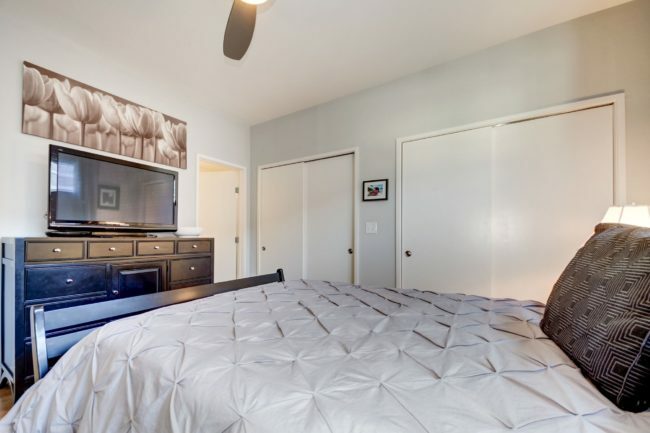 You’ll fall in love with this home as soon as you walk in the door! 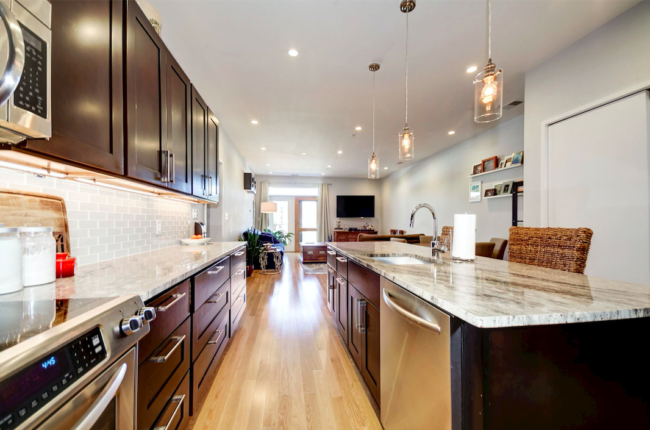 Walking through the front door, you’ll immediately notice your BEAUTIFUL chef’s kitchen. 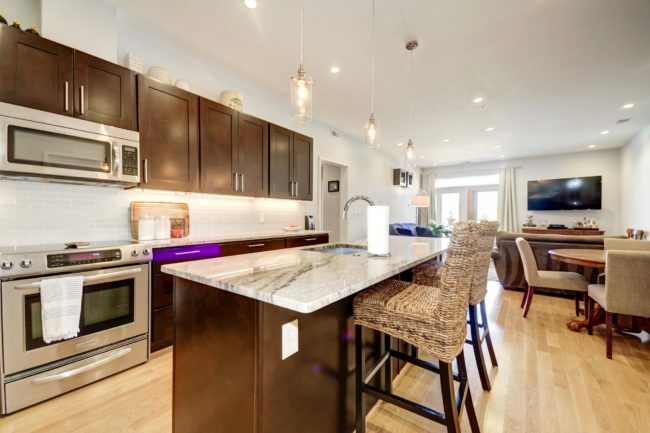 The kitchen is updated with marble countertops, dark wood cabinets, and sleek stainless steel appliances. The kitchen layout with the island breakfast bar is great for entertaining, and great for two cooks in the kitchen! 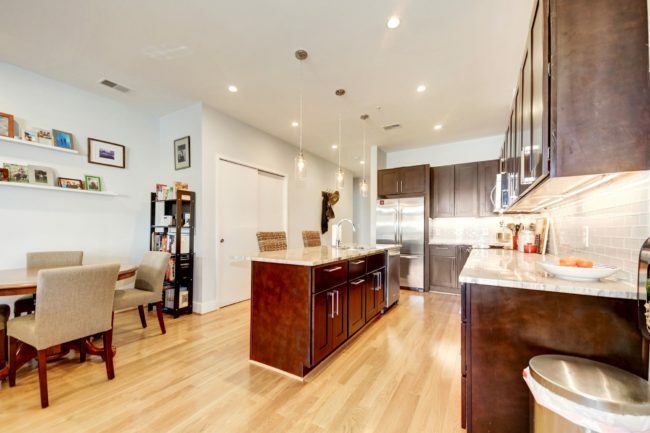 This home’s open floor plan means your loved ones can be with your while you in the dining room while cook up a fantastic meal! 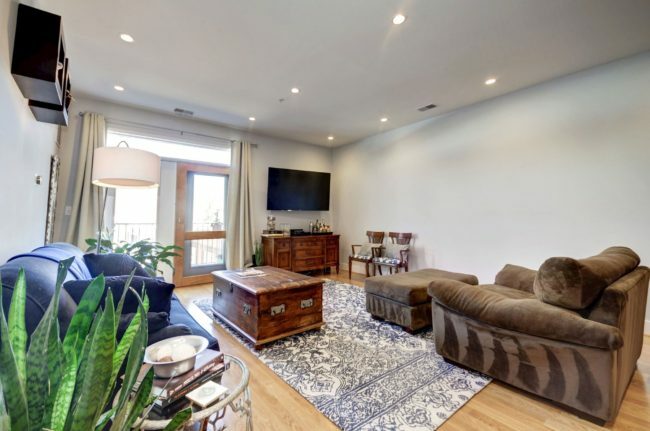 …and overlooking the kitchen, this is the perfect space to host parties, Sunday brunches, or even big holiday get-togethers. 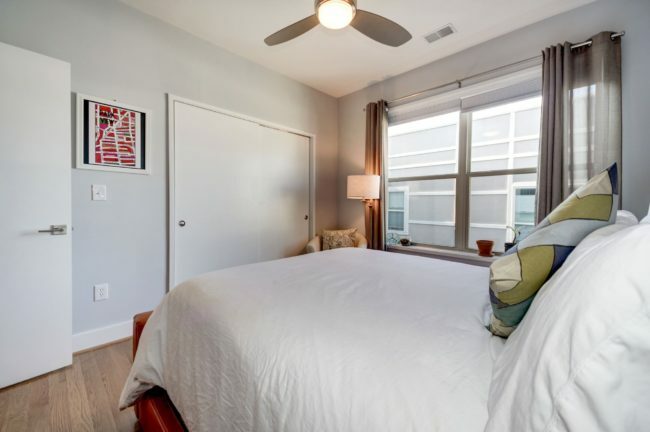 The floor-to-ceiling window and door bring in tons of beautiful morning light, and the best part – a patio! 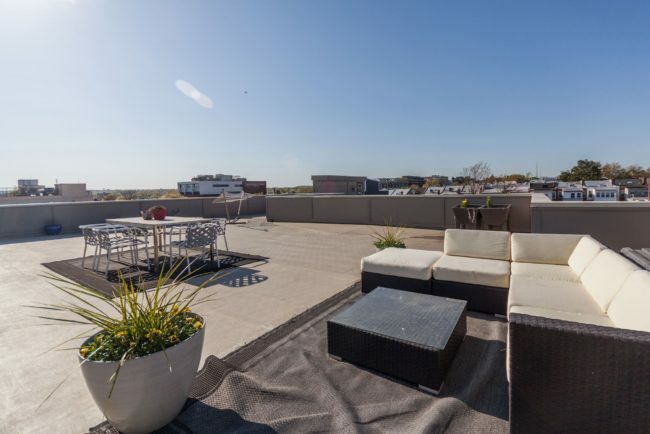 Al-fresco dining made easy with your big patio right off the main floor! 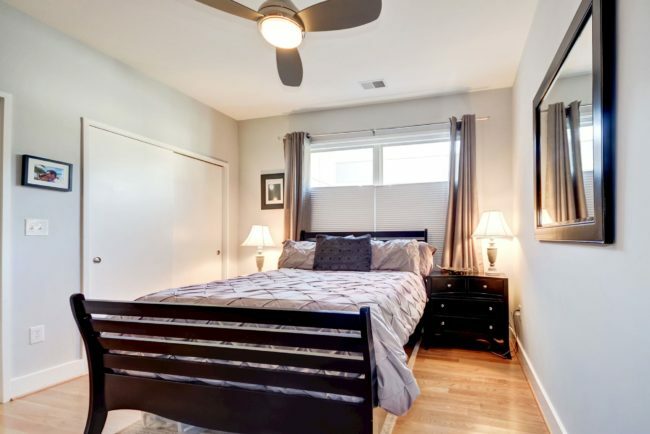 Just down the hall you’ll find the master bedroom, bright and sunny with a ceiling fan for those hot DC summer nights. 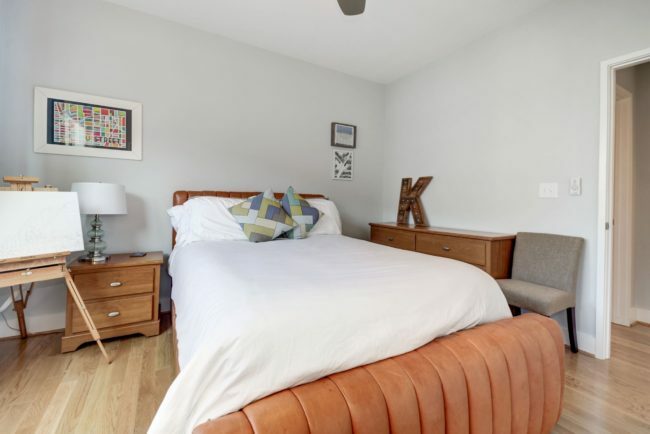 The sellers LOVE all the storage space in this home! There’s two his-and-hers closets, so there is no fighting over space! 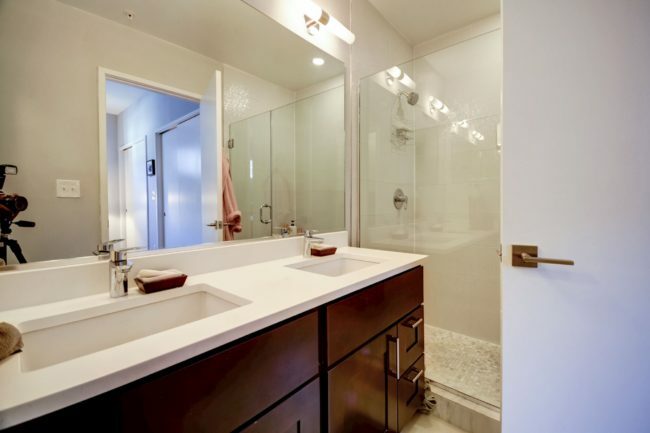 The en-suite bathroom has dual sinks and a big walk-in shower. 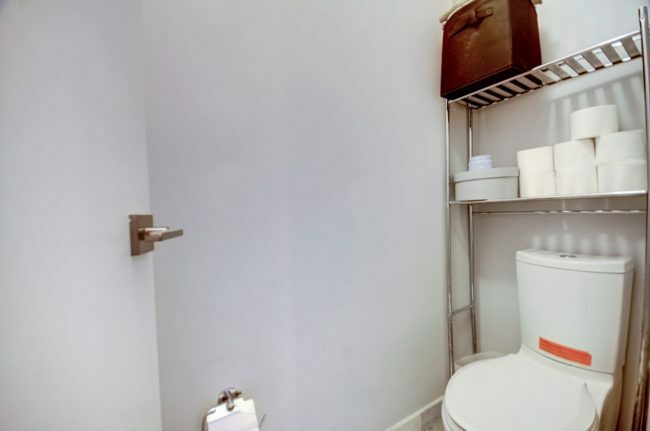 Plus there’s a private toilet area separate from the rest of the bathroom! …and another big closet! Both closets have Elfa system so you can easily change up the layout and add more shelves or drawers whenever you want. 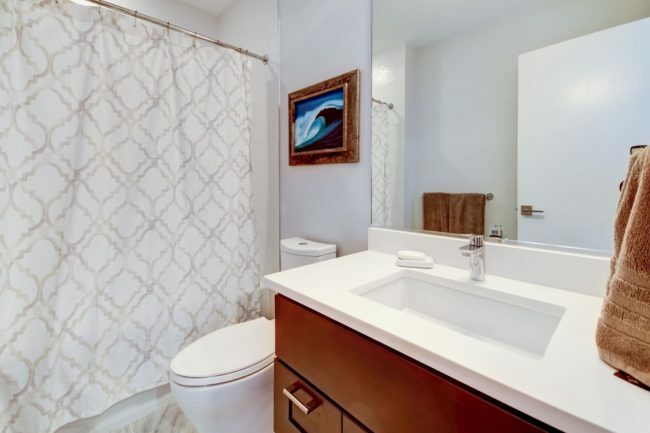 And no need to share bathrooms – there’s a second bathroom for the second bedroom! 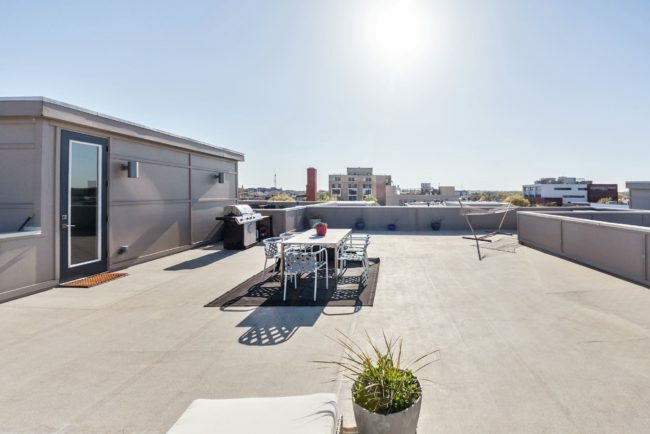 One of the BEST parts of this home – the private, rooftop deck! 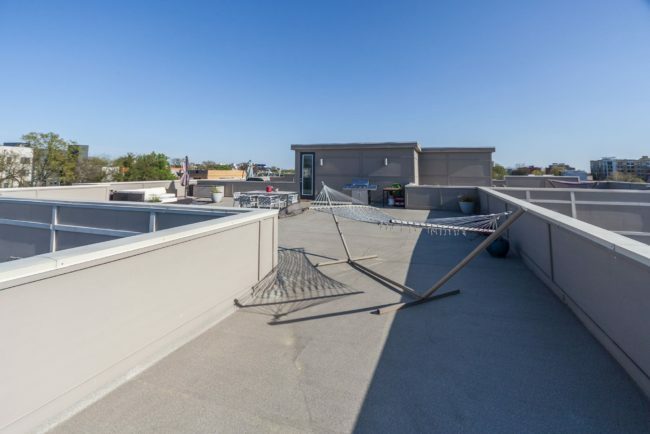 The seller’s had incredible Fourth of July Fireworks parties each year, as well as numerous cookouts. There’s so much room! And with this much space, you’ll finally be able to start gardening! 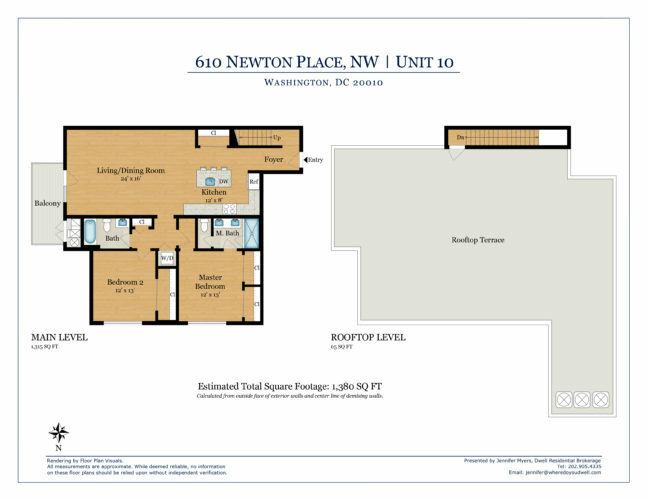 Click on the above image to see the full floor plan! 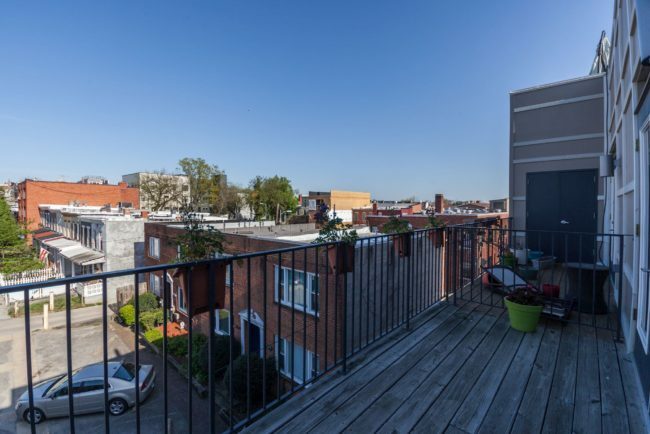 Winner of the Curbed 2015 Neighborhood of the Year, Petworth is definitely a hot place to be in DC. 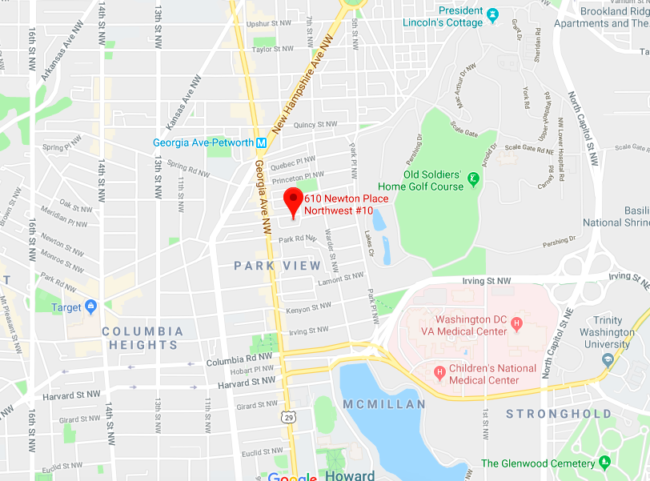 Not familiar with Petworth? 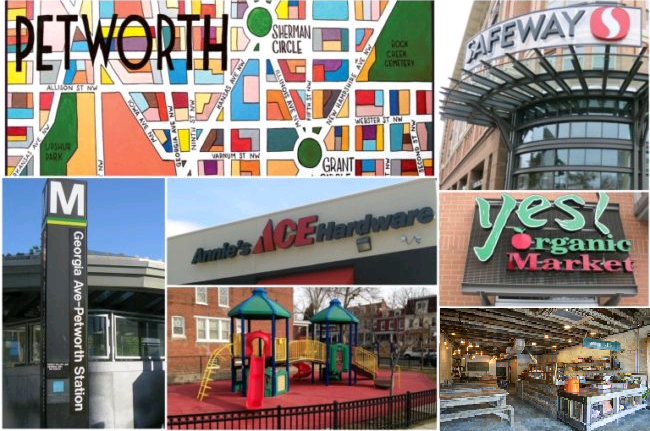 Check out the Petworth News blog, or featured stories about Petworth in Curbed, the New York Times, and the Washington Post. 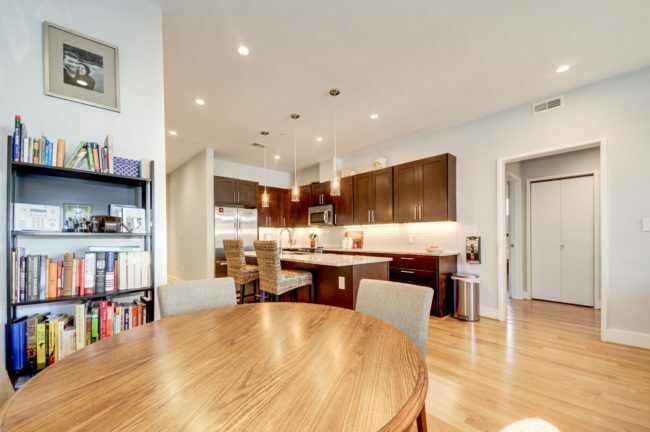 This location is also good for commuters as it’s just a short jaunt to the metro, and the bar and restaurant scene in Petworth/Columbia Heights is HOT. The sellers particularly recommend DC Reynold’s BOGO Happy Hour – perfect for relaxing after a long workday! 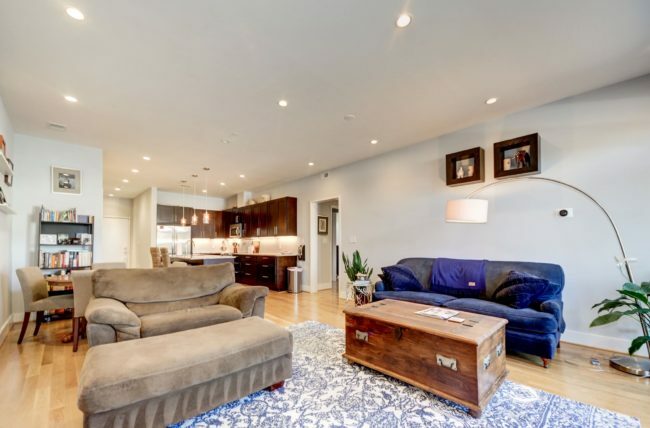 This home is in the middle of everything you could possible want — restaurants, shopping, a library, daycare, and groceries, and a quick metro ride to other DC delights for both day and night.